Categories: Art, Crafts, Events, Exhibitions | Permalink. We had a great time making these Nativity themed Christmas decorations at our drop-in craft sessions at Bishop Street. If you want to find out how we made them please click on the link below for a pdf with full instructions. 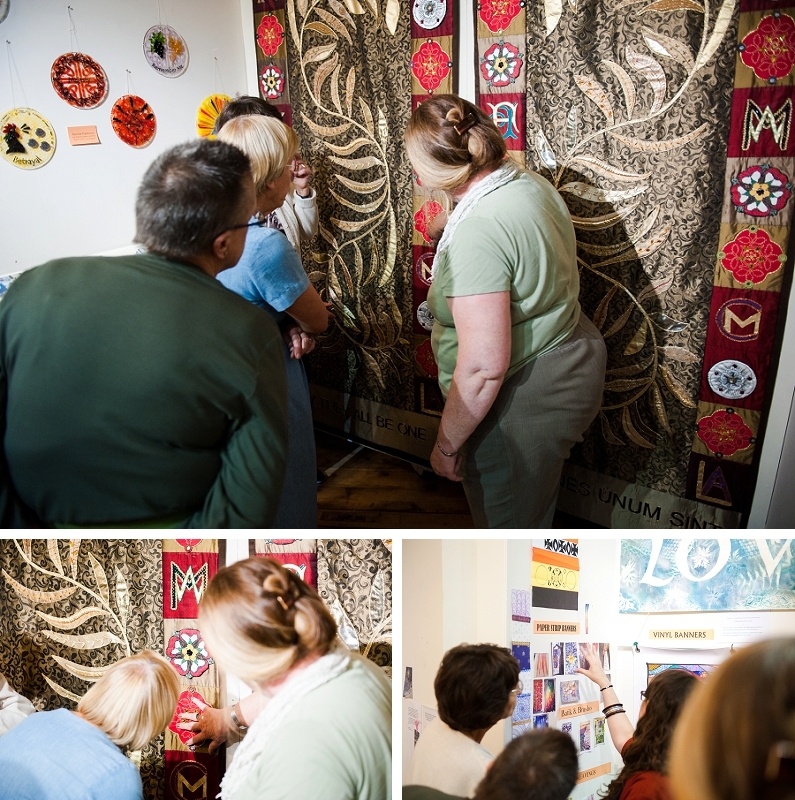 The crafts were chosen to offer a range of activities for all ages and abilities and we enjoyed sharing the company and conversation of all who came along to have a go. Categories: Crafts, Creativity, Events, Spirituality, Workshops | Permalink. Rada brought in some beautiful weavings to share with us made by members of her family in Serbia. Although they were made a long time ago it was amazing how contemporary they look! Ruth and Jenny from Touchstone had brought in some examples of rugs in the process of being woven to show us the various techniques that we could use. They also gave us a goodie bag with some tools, wool and the base webbing for us to create our own rug with. You can even create text! Next Wednesday we will begin to create our weaving! Categories: Crafts, Creativity, Weaving Women's Wisdom | Permalink. WE ARE LOOKING FOR WOMEN INTERESTED IN . . . Sharing stories from our different faith traditions. Spending time together, building friendships. Remembering Wise Women who have influenced us. 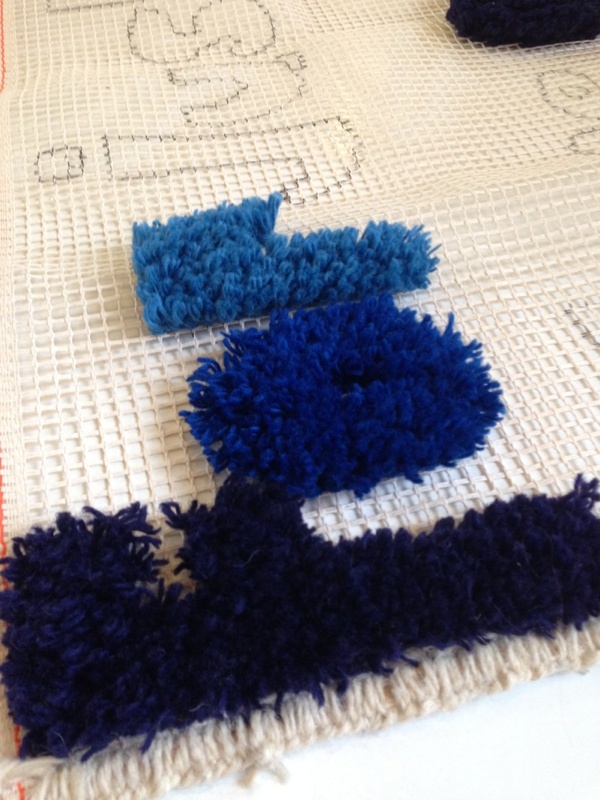 Designing and making a woven carpet rug. Being part of a national project and touring exhibition. 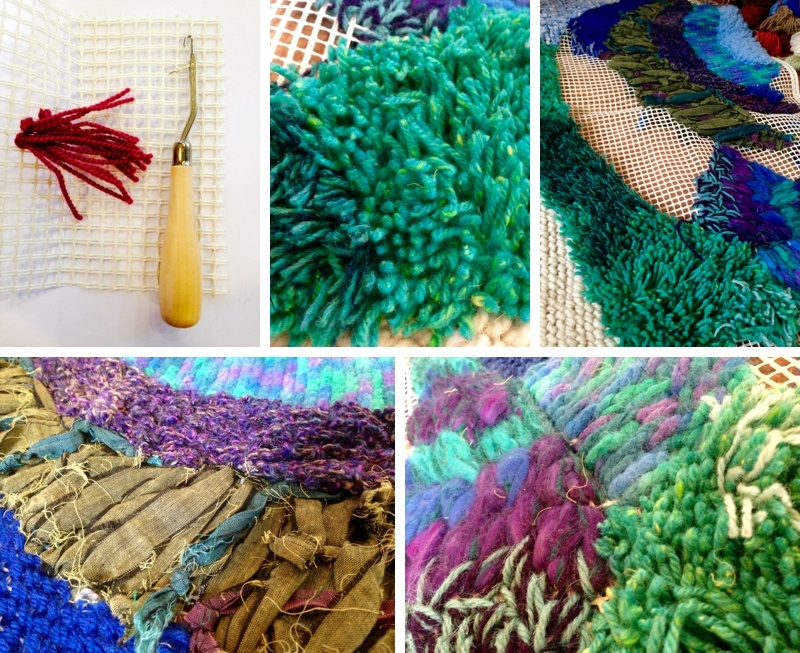 This is a creative national project to encourage new and existing groups of women from different faith communities to join together in weaving rugs. These will eventually be gathered together to make a travelling exhibition, “Weaving Women’s Wisdom”. Whilst they weave, groups are encouraged to have conversations around wisdom, remember wise women that have influenced their lives and faith, share important stories from tradition and scriptures and to reflect on the wisdom that they have both experienced and shared. The purpose of this project is to enable women and girls to have safe space to share their stories and to form honest and joyful interfaith friendships. The project runs from Sept 2014 to end of March 2015. The national project is co-ordinated by The Touchstone Centre in Bradford. 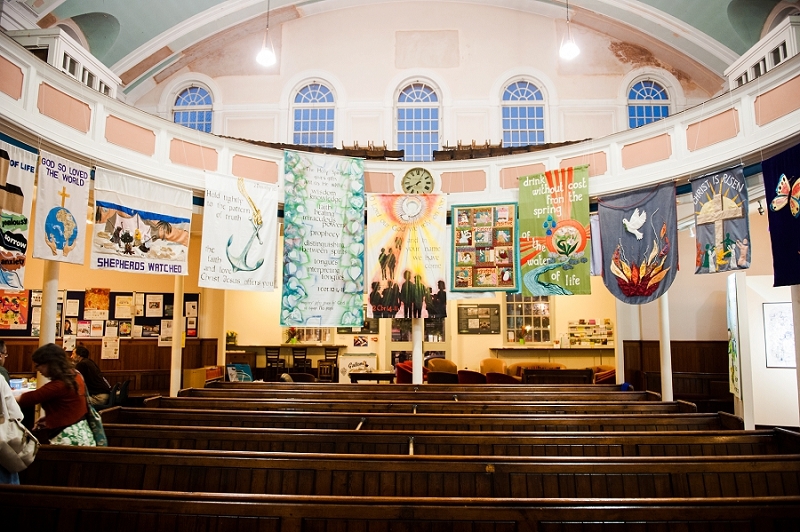 Touchstone, a centre for Methodist interfaith work is a ‘listening community’ with the vision of making safe places of hospitality where people of different backgrounds can listen to and talk with each other. 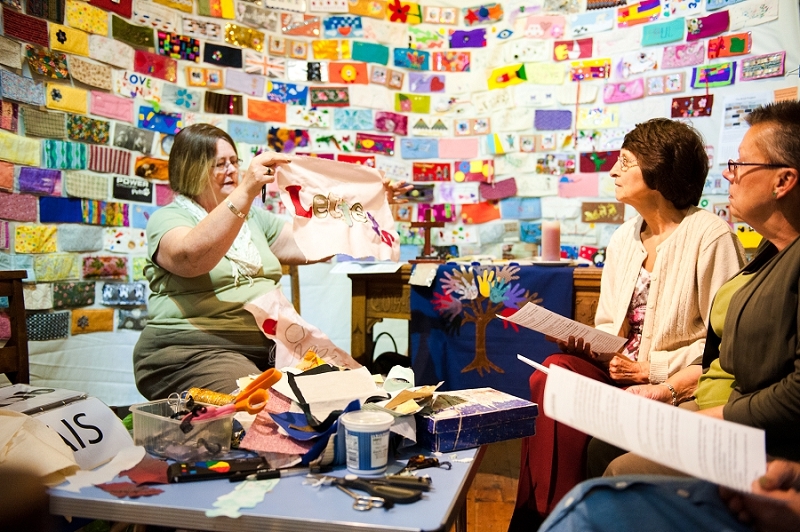 Art at the Chapel is facilitating a Leicester group to be part of this exciting project. You are welcome to join us for any of the sessions below. It is fine to ‘pop in’ and help during any of these times even if you can only spare half an hour! WED 28th Jan 2015: 1pm – 3pm Bishop Street Methodist Church. An introduction to the project and chance to meet each other. 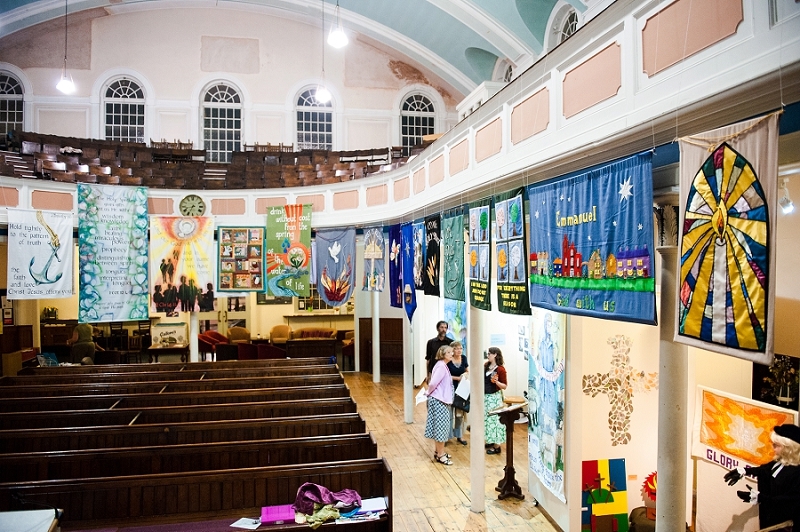 SAT 7th Feb 2015: 11:00am – 2pm Bishop Street Methodist Church: Working together on our weaving. WHO CAN GET INVOLVED: Women of all ages from all faith traditions. GET IN TOUCH: If you would like to get involved or simply want to find out more. 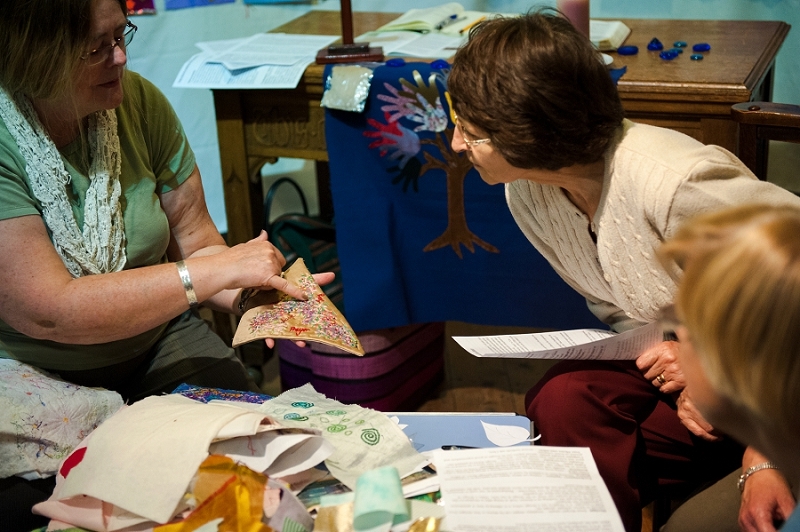 Categories: Art, Crafts, Creativity, Events, Interfaith, Weaving Women's Wisdom | Permalink. Chris Watkins from the East Leake Banner making group led our third workshop. With many years experience as a textile teacher and accomplished fabric artist Chris inspired us with a vast array of tips and techniques. Keep designs simple: Templates shapes can be drawn or free designs from internet i.e. leaves, animals, people etc. Note Copyright- it is illegal to use a design unless it is offered as free or permission is granted by the designer. If a group of people are working on a Banner, look at being able to breakdown the design, so several people can work on the design at one time. Make a design of components and then put them all together. The use of colour is very important – Background do not want to dominate. Design needs to stand out. Be prepared to move around and play with the elements to get the best result. Chris brought lots of samples to illustrate her talk which included how to transfer photographs onto fabric. Applique: Cutting out fabric shapes and applying to a background, Quilting, stitching lines or a pattern by hand or machine through layers of fabric. Embroidery: Cross stitch – using even weave fabric and embroidering a design following a chart. Bondaweb – fusable web used to stick shapes onto background using an iron. Can drawn on the paper side- REMEMBER to REVERSE IMAGE. Fabric paint: Variety available- follow instructions may need to be ironed to set. Transfer crayons/paint: Similar to wax crayons – design drawn or painted ono parer and ironed onto man-made fabrics – polyester. Computer transfer prints: Special papers can be bought at good supermarkets and printed on home computer. Your Photos onto fabric. – several methods ask Chris. A variety of decorations can be used -beads, sequins, braid cords, tassels, etc Ensure that they are well attached. Use strong thread and sew on well. Wadding: A layer of cotton/polyester wadding is added to the back of the design, to give extra support and body to the banner. Backing: A suitable piece of fabric will need to be applied to the back of the Banner. Bagging out: The backing fabric is placed onto he right side of the fabric and machined around the outside edge, leaving a gap big enough for it to be turned through to the right side. This gap is them hand sewn together. OR The edges can be Bound either using an edge binding or by bring the backing fabric over the edge and on to the front of the Banner. Weighting: It may be a good idea to add some weight to the bottom of the Banner- this may be a strip of wood or metal which can be enclosed in the bottom hem. Tabs: Pieces of folded fabric applied to top of banner for a piece of wood or metal to be threaded through. Sleeve: A piece of fabric added to the back of the Banner at the top for a piece of wood to be threaded through. Commissions: East Leake Banner group via Chris. Chris explains how the Banner the group created for English Martyrs was made. 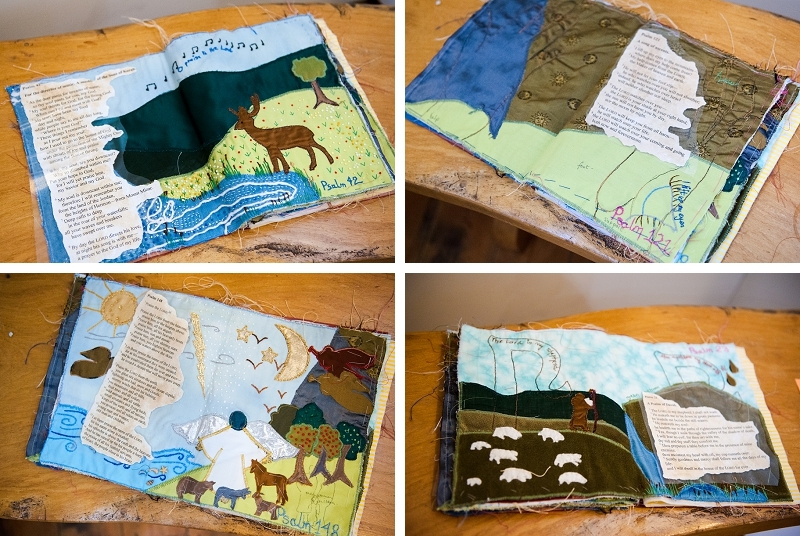 This fabulous book is Chris’s contribution to our Inspired by the Psalms Exhibition currently showing alongside our Banner Exhibition. The exhibition is up until September 24th 2014 so if you haven’t seen it yet why not pop in and grab a coffee at the same time. Categories: Art, Banner Making, Crafts, Creativity, Events, Spirituality, Worship | Permalink.